This CellML model runs in both OpenCell and COR to recreate the published results. The units have been checked and they are consistent. Note that the CellML model represents a single cell (N=1). ABSTRACT: On the basis of a detailed model of yeast glycolysis, the effect of intercellular dynamics is analysed theoretically. The model includes the main steps of anaerobic glycolysis, and the production of ethanol and glycerol. Transmembrane diffusion of acetaldehyde is included, since it has been hypothesized that this substance mediates the interaction. Depending on the kinetic parameter, the single-cell model shows both stationary and oscillatory behaviour. This agrees with experimental data with respect to metabolite concentrations and phase shifts. The inclusion of intercellular coupling leads to a variety of dynamical modes, such as synchronous oscillations, and different kinds of asynchronous behavior. These oscillations can co-exist, leading to bi- and tri-rhythmicity. The corresponding parameter regions have been identified by a bifurcation analysis. The oscillatory dynamics of synchronized cell populations are investigated by calculating the phase responses to acetaldehyde pulses. Simulations are performed with respect to the synchronization of two subpopulations that are oscillating out of phase before mixing. The effect of the various process on synchronization is characterized quantitatively. While continuous exchange of acetaldehyde might synchronize the oscillations for appropriate sets of parameter values, the calculated synchronization time is longer than that observed experimentally. It is concluded either that addition to the transmembrane exchange of acetaldehyde, other processes may contribute to intercellular coupling, or that intracellular regulator feedback plays a role in the acceleration of the synchronization. for appropriate sets of parameter values, the calculated synchronization time is longer than that observed experimentally. It is concluded either that addition to the transmembrane exchange of acetaldehyde, other processes may contribute to intercellular coupling, or that intracellular regulator feedback plays a role in the acceleration of the synchronization. 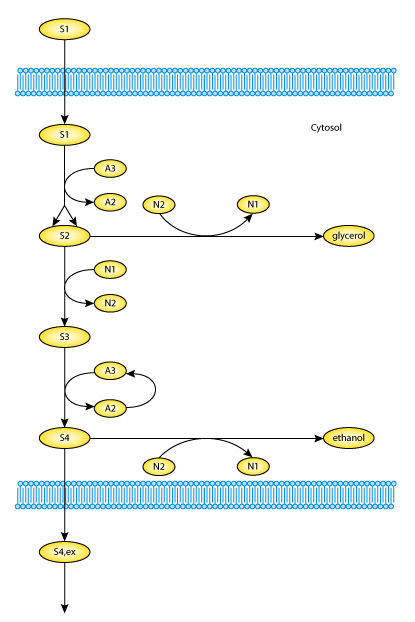 The scheme shows the main reactions of anaerobic glycolysis in yeast, in addition to transmembrane transport of glucose and the coupling substance (S4,ex). For further explanation of the symbols used, see the text. Derived from workspace Wolf, Heinrich, 2000 at changeset c2a8e06d7c39.